Whether you’re looking for something simple or intricate, you’ll find it all in our Marden designer lights collection. From simple Mooney pendants to stylish Amara lights, Mica Lighting has created a collection with the best pieces from Marden designer lights. If you want a little European touch for your living room, you can try any of our pieces. From classic to contemporary, we have products that would suit all tastes. Let these pieces add a little style to your ambience, as they allow an easy way to accentuate the mood of a place. 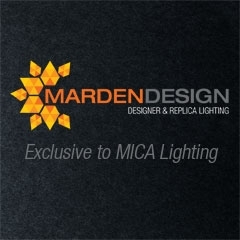 Transform your space with just a flick of a switch with Marden designer lights. Our Price: $68.00 GST incl. Our Price: $71.00 GST incl. Our Price: $105.00 GST incl.